Sweet Mystery: CakeSpy Needs Your Help! There's no delicate way to put it: this pastry, purchased at Hess Bakery in Tacoma, kind of looks like a mound of poop. A delicately swirled mound of poop, mind you. What makes up this mountain of yum? 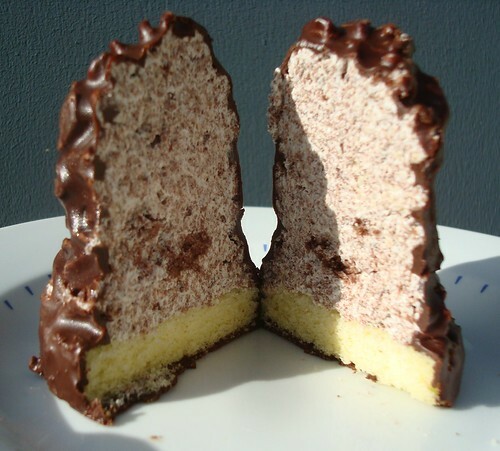 Well, what you've got is a bottom layer of yellow cake, topped with a mound of cake crumbs mixed with buttercream, which is then topped by a cascade of rich chocolate which is firm but yielding (not crunchy) when you bite into it. It is completely decadent and delicious--and officially the newest CakeSpy obsession. However, what is unclear is the confection's story and name. It being that it was purchased from a German bakery, it likely has Teutonic roots; the bakery employee I spoke to called it a "granachebitter" -- but I am spelling this phonetically as she was not sure how it was spelled and the baker was not around to field questions. It's possible that I mis-heard and the first part was "ganache" (which seems like it would make sense), but I am not sure! And so I appeal to you, dear readers: does anyone know what this baked good is, or where a recipe might be found? UPDATE! 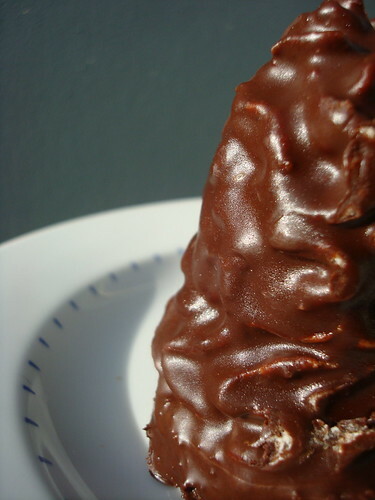 Per a tip from German CakeSpy reader Iris, I've learned that the pastry in question is actually called Granatsplitter, which translates to "Shrapnel" or "Shell Splinters". Well, it certainly is an explosively delicious treat! This recipe suggests Granatsplitter as a good way to use leftover cake. Also, we've gotten a recipe! Savvy CakeSpy reader Teresa enlisted the help of a German acquaintance to translate this recipe for the Granatsplitter! Mix flour and baking powder and put through a sief on a baking board. Make a hole in the middle and put sugar, spices and liquids in and part of the flour. Put the cold fat, cut in pieces, on top of it, cover with flour and form dough. If it is sticky, refrigerate for a while. Then make a thin dough from a round mold (like for round cookies) and bake 10 minutes at 175-195 degree C.
Let the coconut fat melt and refrigerate. Put powdered sugar through a sief, add vanilla sugar, cocoa (sief) and rum in a bowl and stir bit by bit with egg and handwarm coco-fat. Break half of the cookies in pieces and mix with the almonds in the cocoa-dough. Put this dough hill-shaped on the rest of the cookies. Topping: put cocoa and powdered sugar through a sief and add water and liquid butter until like liqued chocolate. Put on top of the cookies and refrigerate. If you're in the Tacoma area, you can get one for yourself (and don't forget to pick up a Pretzel Roll too!) at Hess Bakery, Hess Bakery & Deli • 6108 Mt. Tacoma Drive SW • Lakewood, WA (253)577-5888; online at hessbakery.com.